Dr Ruth Blackham is a Consultant Bariatric & General Surgeon. 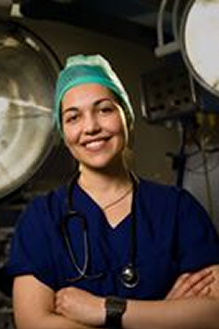 Dr Blackham grew up in Perth and completed her surgical training in Western Australia. As a trainee Dr Blackham won a number of awards including AMA Junior Doctor of the Year in 2013 and the John Corboy Medal of the Royal Australasian College of Surgeons. She was also the recipient of a competitive Winston Churchill Memorial Trust Fellowship encompassing international visits to Surgeons in Toronto, Ottawa, Montreal, London and Singapore. She completed a two-year dedicated Bariatric Fellowship beginning at Western Surgical Health under Professor Jeff Hamdorf, A/Prof Sue Taylor and Dr Jeremy Tan, before moving to Melbourne. Dr Blackham performed and assisted in bariatric surgery at Austin Hospital, Heidelberg under the supervision of Mr Ahmad Aly, President of the Australian/NZ Metabolic Obesity Surgery Society (ANZMOSS). During her Fellowship she was the awarded scholar of the IFSO Asia-Pacific Chapter (London) as well as recipient of the ANZGOSA Younger Fellow scholarship. As an academic Dr Blackham has completed a Master of Surgery. Her thesis focused upon skill acquisition in laparoscopic surgery. She is a PhD Candidate focusing upon Safety and Quality in Bariatric Surgery: validation of a sleeve gastrectomy curriculum. She is also a Board member of the Australian/NZ Metabolic Obesity Surgery Society. Dr Blackham has returned home to WA to take up a Consultant position with Western Surgical Health as a Specialist Bariatric & General Surgeon. She is also a Senior Lecturer at CTEC (UWA), a designated facility specialising in surgical education helping train the next generation of surgeons.